Some sat in darkness and deepest gloom, imprisoned in iron chains of misery. He led them from the darkness and deepest gloom; he snapped their chains. Depression. Disaster. Devastation. Loneliness. Broken-hearted. Poverty. Hopelessness. Lost. Abused. Hurting. Confusion. Fear. Weakness. Failures. Lack of knowledge. No self-esteem. Pushed away. Not included. Feeling left out. Anxiety. Panic attacks. These are just a sample of some of the chains which bind us as humans and keep us away from the things of God in our lives. 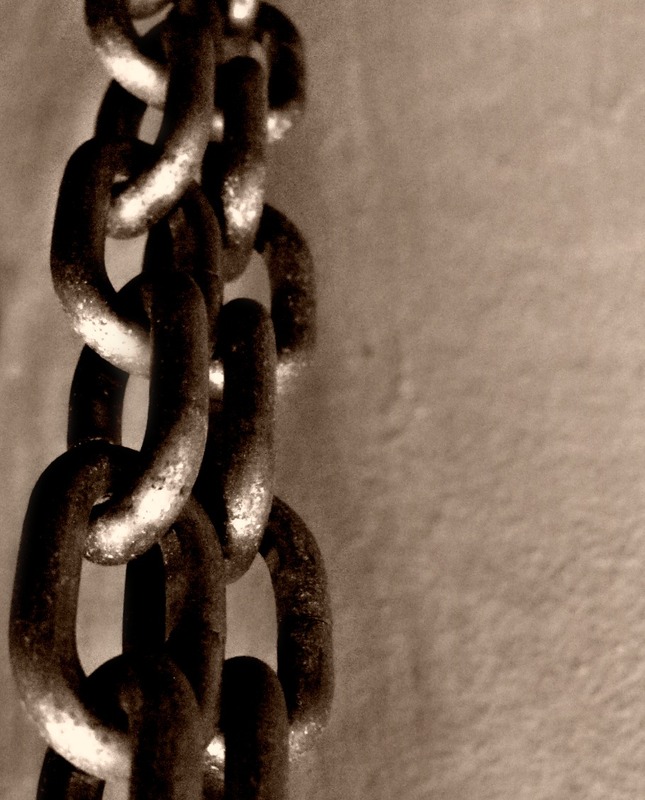 How do we go so willing into the darkness and allow these chains to be placed upon us? What lures us to such deceiving thought processes? How in the world do we manage to ever find our way when we are so lost in what is not God’s desire for us? Pretty sure we all know who to blame for the interference in our relationships, Satan. He seeks to destroy the things God has for us or in some cases, never allows people to even see what God has for them. There are times, and I know this will seem strange to those who know me personally, but I can be in a room full of people and still feel left out even when I know 90% of the persons present. How can that be? I am not sure if I can explain it but surely Satan sets out to separate those who are connected with God and set them apart from those who can be a good influence in their lives. Sometimes, feeling alone is a choice, other times it comes from a bit of jealousy and we just get all flustered and feel like we just don’t fit in. I feel part of my lonesomeness in a group comes from my childhood. I was teased a lot in elementary school, always the last one to be picked for games and often was just felt like and unloved outcast. My self-esteem at an early age was already out of whack and no matter how hard I try to heal, there are times when my past just rears it’s ugliness and I get lost in a bit of self-pity. I sometimes look at a group of people and see little conversations here and there and I just do not feel as though I would fit in. Do you see how Satan slips in there and starts working on ones mind? I might be in the company of several who love me for who I am but he takes my mind back to earlier days and I linger there long enough to switch my perspective of the people in my presence. This can happen in any aspect of our lives and this is where we almost willingly put on our chains. We need to begin to overcome our past and begin to live as God intends, freely. We need to choose to fit in or to stay outside of the group. We can choose to be happy or sad by living according to God’s purpose in our lives. I know it sounds easy, but it is difficult at first to overcome, however once you start you just can’t stop because it just feels so right. Two years ago, I never would never have thought I could find myself again after many years of destruction in my life. I had accepted my life for what it was, a merry go round of one disaster after another. I saw no end in sight, yet I just wore my chains day in and day out. I woke up, pretended to be happy so no one would know what was going on behind the scenes and tried to conquer another day. Shortly after I was separated from my husband, God began to show up in my life like I never expected. He began to show me who He wanted me to become. He instilled a new passion in me and I started to overcome fears and feelings that I didn’t even know were there. He demonstrated through others, just how I could become free from my chains. As I walked out in faith into uncharted waters, I faced the fear of living alone, paying my bills on one income, raising two teenagers on my own, managing to keep a vehicle in running order, fixing things around the house and many other obstacles. My “I can’t” attitude quickly changed to “Wow! I did that? !” The day I fixed our front door I think the neighbors probably thought I went momentarily insane. As my confidence grew, the fear chains fell off. As the fear vanished, the hopelessness dissipated and now that there was hope again, I could be free to love my life again and grow in my relationship with God. All the while being a witness for God. We can all find this freedom. It may take searching out someone you trust to help you. It may only take stepping out in faith from a situation you know is not healthy. We need to choose to be happy and content with this life we have been given and freedom from our chains only comes from our loving Father in heaven. No one on this earth can totally free us from the pain we have experienced. We need to search God for our inner healing and place our trust in Him. Counselors can help you to a certain extent, however God is where the freedom is granted. Once we are free, we can see the hope God has for us. We can clearly see where we are destined to be. We begin to be in tune to the plan God has for our lives, perhaps something we did not think we were capable of. For me this is public speaking. Yes I had confidence in my ability to be a writer, but to speak in front of a group was the last thing I thought God was asking me to do. Since I have stepped out in faith, I have spoken to a few groups and I discovered how much I love it! We all have the ability within us to overcome, we just need to begin to choose overcoming as a necessity in our daily lives. 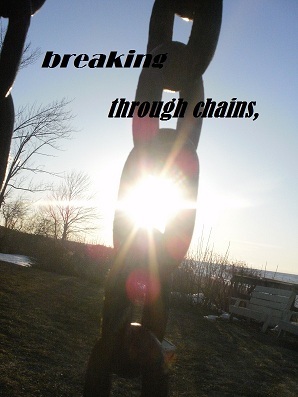 I hope I have given someone a tid bit of insight about breaking chains. Being bound to the things which cost us so much is not healthy and keeps us from obtaining all the wonderful blessings God has for us. Choose today to become free of your chains. Truly I am honored! All glory to God! Be Blessed!!! Much love to you too Stefanie! I am just tickled that you have a “Brenda Folder”:) Be Blessed!!! This was a great posting, very encouraging for me since I am newly separated and the shame of it all makes me feel very distant from others. I am not feeling the embrace of my church family around me although, I know many of them have prayed and what else could they do? But when the church is all you have, it feels like something is missing. Where is the love? Am I expecting too much from the body? I know that I must run to the Lord for all my needs, but I am somewhat disappointed, in what should be my family. I have served in the church. I’m feeling estranged, but I am trying to be careful not to judge, since, I am hurt and emotional the enemy could use this too. Thank you for post and expressing my very own heart. Gigi, God loves you no matter what and some times people just do not understand. I have been separated from my husband (see my testimony if you have not already read it) for almost 3 years now and people either do not understand why I have not divorced him or why I am not active in his life trying to help him. All I can say is that it is all in God’s hands and I have no control over it. When you begin to listen to God in your life and not the ones who think they have all the answers, your perspective changes and you begin to believe God for all that you will ever need. I prayed for friends who would accept me for who I am and God sent me some very strong Christian women who support me. I will pray you find acceptance in the Fathers arms as He begins to show you persons in your life who will love you for who you are not what you have done. Be Blessed and never give in to temptation or be deceived by that which is not of God. He surely has a hand in your life whether you can see it or not.